arr Maun. Met by tour operator, drive in custom made bush vehicles to Makgadikgadi/Nxai Pans National Park, camp for two nights with daily game drives into park. Nxai Pan is the only park in southern Africa where impala and springbok may be seen together. Also anticipate leopard and cheetah sightings here. 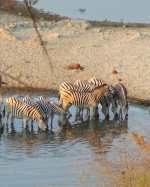 Drive the short distance to Central Kalahari Game Reserve via the now flowing Boteti River. Camp near Deception Valley for two nights. Returning via Maun to overnight camp at a community camp site adjacent to Moremi Game Reserve. Day trip into nearby Okavango Swamps, with bush walks and makoro rides on edge of the Delta. Return to camp at the village community campsite. Enter Moremi and camp for two nights in what many people consider Botswana's premier game reserve. Take daily or morning and evening game drives in tour operators vehicles. Bush camp along the Kwai river, always abundant with game. Head north along Savute channel to overnight camp at Savute camp site . Look for famous Savute lion prides resident in the area. 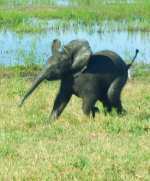 This is one of the few places in Africa where lion have learnt to hunt fully grown elephants. Drive north through Chobe National Park to camp for two nights overlooking the Chobe river. Watch some of Africa’s largest elephant herds bathing and drinking. After an early morning game drive along the Chobe River, head for Kasane where our safari ends. **Optionally include a visit to nearby Victoria Falls in Livingstone, Zambia after the safari replacing the Central Kalahari Game Reserve. This safari which runs Maun to Kasane can also be run in the opposite direction, ie Kasane to Maun to suit flight schedules or individual travel plans. Alternatively 5,7,and 10 day options also available. Please enquire or see Africa Guide safari ID 1480 run by the same operator. A word about this safari. A driver/guide and crew will accompany you, who will do all camp chores, erect and take down camp, all cooking and serve meals. US$ 3,995 per person for a minimum of three people. -transport as indicated above, in special bush vehicles. -use of all camping equipment, tents etc. -camping and entry fees to National Parks. 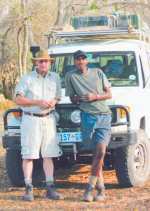 -daily or morning and afternoon game drives in tour operator vehicle. -medical health, loss and evacuation insurances.